Moving to Southborough in 1973, after learning their trade from Chrissie's mother and father, Mike and Chrissie built their bakery in the "back garden' and opened a shop on the main road. The business just grew and grew and now their two sons Robert and Richard have taken on the family bakery tradition. Their whole concept of baking is to maintain the simple, traditional methods of production so no dough conditioners, improvers or accelerators are used in their breads and they make as much confectionery as they can "from scratch". We are now a third-generation, family bakery based in Southborough, Kent where we bake a large selection of traditional and speciality breads including rye, spelt, herb, tomato and our own Rusty, as well as rolls, pasties, buns and cakes. We also have a thriving wholesale business, a specialised cake making service, sell free range eggs and can produce personalised greeting cardstoo. 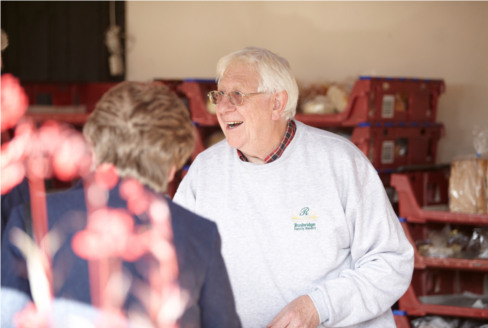 The Rusbridge's have become firm favourites at many Farmers' Markets in west Kent and they were one of the first stallholders to realise the potential of selling Farmers Markets. Their success is due both to the quality of their ingredients and to the wide range of flavoured breads. As well as the usual tasty White and brown breads (the unusual being a White Huffkin ! ); the Rushbridge's bake 100% Wholemeal, Malty Granary, sun-dried Tomato, Italian herb, olive and garlic, spelt and rye breads. These are always freshly made for the Markets (in both roll and loaf form). Particular favourites are their "Southborough Seedy' or "G.I.' 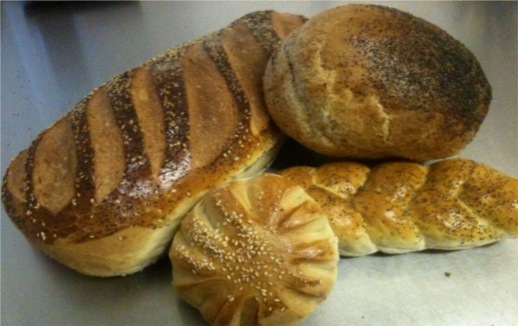 bread, which combines rye, oatflakes, sunflower, pumpkin and linseed, as well as their 'Rusty's Special' . Being Master Bakers they make a wide range of Cakes with the most popular being their Sticky Lemon and Kentish Apple cakes. They also make all sorts of pastries, sausage rolls, Cornish pasties, croissants and the good old favourite Gingerbreadman. All of these may be ordered in advance as can any of the breads. In her spare time Chrissie makes "Cards for all Occasions' either sewn with metallic thread or decoupage and she offers a personalising service should it be required. These are also sold at the farmers' markets. They also sell 'Rusty's Eggs' from Jockey Farm at Rusthall which is owned by Mike's brother. The hens are totally free range and can be seen at any time by visitors to the farm and the eggs that are sold are laid the day before so couldn't be fresher.